Although my temptation is to jump straight into a preview of the RedRockBerger Combo, Browny is where I’m starting as he will be cheap, fit and… its Brown Dawg! Goodbye no +30 rule? Why shouldn’t I pick him? Firstly he is the wrong side of 30 and we are talking about a guy who has managed to play just 2 out of 11 full seasons through his prime. Last year he managed to score triple figures on only one occasion so why should this year be any different? Especially with the loss of reliable team mates such as Luke Power, Mitch Clark and Brendan Fevola. OK, retract that, the words reliable and Fev or Clark should never meet in a sentence. Although he is an absolute superstar who is capable of 150+ scores, only once in his career has he average over 100, so why would this year be any different? Deck of DT Rating. Queen – If you weigh up price vs potential, I think Browny is somebody everyone must consider, and if his injury free run continues during the pre season he jumps into the must have category. The Lions have quite a few young guns and will be an improved unit this year so the natural development of the team will also help his value and average rise from last year. At worst, he is an expensive cash cow while his body holds up, or decides to run face first into a team mates knee. Oh that’s right, Clark has gone! That can now be considered another positive in Browns advantage. My current consideration rating is 70%. UPDATE: Our boy Tom Rockliff tweeded me and said Browny is in great form and would currently come into captain consideration. I am now up to 85% if his good with injuries continues run. I was 80% on him until I read that he has 6 out of the first 10 games at the Gabba, which includes GWS and GS! I will, however, continue to enjoy every single thing that weakens the Brisbane Bears. Richy-telly, Power, Clarke, Fev and a couple of hundred assistant’s have all left to the sound of my laughter. Not going to get this kinda potential for this cheap. At worst he needs to be upgraded. We’ll only need half a dozen good games! Lock and load! Locked in! When on song, is there anyone better to cheering on to 140+? I’m seriously considering bringing Brown into my starting lineup for Round 1. At worst I suppose he gets injured in Round 3, drops in value and I have to waste a trade on him to get him out. At the very best I suppose he could be a kepper. I’m predicting he will increase in value and will be useful to updgrade to an out and out gun. All depends on the price. Only if he’s really cheap, as in under 300k. Has got to be a real consideration in my forward line for 2012. I’m sure he will come back bigger and better. Does anybody know when those of us without the assistant coach will be able to start picking our 2012 team. I think its Feburary some time but not sure????? Yeah I believe it’s Febuary 1st as usual, you should’ve gotten the assistant coach we get it in about a week! I am crying that I didn’t get it! I didn’t get it out of some deluded sense of pride that I would look up stuff myself. Now, I am willing to pay someone to sign over their email and team to me! I recon’ I just need to find a twelve year old that has a team and slide em’ a couple of hundred and get them to sign a confidentiality clause. Shouldn’t be a problem. It really depends on your expectations, and how your forward line is designed. Last season big Roo was seen as an underpriced premium due to a poor run in 2010, however he proved more frustrating than watching any Adelaide Crows last quarters last season, or listening to the Buckley/Malthouse media hype all year. If you pick him and are happy with an 80 average, he is still reasonably priced. If you get upset if he gets 67 one week, followed by a 121, and back to 75, then I doubt he is for you. Brown will be a rollercoaster next year thanks to his age and young team around him, but if you can ride it (and so many choose/chose to do so on H.Shaw) then he is certainly worth the consideration. You might as well get him for his round 1 and 2 140+ scores. Then I will get him at round 3 and enjoy his next 12 weeks of groin, back cheek sub 50 scores! Well I guess DT is about taking risks so JB would have to be considered. His scoring potential is enormous as are his chances of getting injured due to his selfless, courageous way he plays, his age, and previous groin/groin related injuries. With 15 out of the best 20 fwds, (the top 9 fwds,) having their bye(s) in rnds 12 & 13, he would certainly fit most teams fwd line structures. Big JB is a lock for me. Came into early considerations as a premium last season, thankfully I didn’t pick him up, but you can’t resist him this year. It’s gonna be a no from me. Had this bloke in 2010 and wish i has never got him, missed way too many games due to injury and being rested and that was when he was 28, at age 30 it’s hard to see him playing over 20 games this season. Personally in terms of DT greatness and scoring ability i reckon he is way past his best. He’ll probably average something in the low 80’s this year and play something like 17 games which isn’t what i’m after in a premium forward. J Brown = $230k. Mega bargain plus even if you use him as your emergency he will average 80 as a minimum. Much better than any rookie output. Mate, if I was sure he would play 17 games and average 80 I would lock him in as a 6th forward or an upgradable mid-pricer. But, I think your stat’s are optimistic. Maybe I am crazy for thinking about this lunk. Let’s face it, talking is really a strain for Brown. DAYNE BEAMS and SIDEBOTTOM are going to be classed as Mid/Fwd in 2012. Surely Beams will be a lock in every team as a result. GIBBS is classed as a midfielder only….not picking him in that case! If that’s the case getting Beams in forwards and Zaharakis in midfield, yeah baby! I will break things if Gibbs is only a mid. And Beams a forward lock? Hmmmm, Steele is for me at this stage. It’s breakout time. Slim pickings for the teams who have a bye in Round 11, meaning that it is unlikely that you will be disadvantaged by selecting Brown. Jonathon Brown shares a bye with Jonathon Brown? No way get outta here..
Haha, it’s so I can copy and paste for different forwards who have the bye in Round 11. So in other words he’s good to go, no clashes with any fantasy relevant players! Tempting, but will have to pass. Injuries and age are concerns. Plus, he is in that awful price bracket (220-300K). In result of that, he doesn’t fit my structure. He is passed his best, but should still average high 70’s low 80’s. He is 30 years old. Has been injury prone the past 2 years and plays as a forward in a rebuilding side. Can someone please explain the Ace, King, Queen, Jack system. Is Ace like 100+ and Jack like 75-?????? Just think of it as a ranking system of Dream Team Impact, more than a score range. EG, Goddard and Gibbs lay claims to an Ace due to their position in the back line and scoring potential. If they could only play mids, they would be more of a King (as there would be others who rank higher: Swan, Boyd, etc). Put simply: If you were playing poker, would you want a pair of aces, or a pair of jacks? It’s all about value. ACE: Premium. Potential captain option. KING: Expensive, or could have some value… but ultimately a keeper. QUEEN: Mid range player with potential upside. I think I know who is on tomorrow. Out of Jason Porplyzia, Rory Sloane or Scott Thompson. 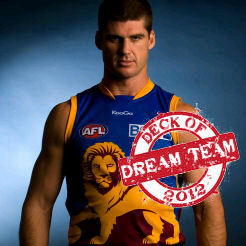 It’s going to be an Adelaide player at least cause Dunny said this in “Deck of Dream Team 2012: Starts Saturday”. Sloaney’s gonna be my sentimental selection this year, even if it means foregoing Hayes. He’s certainly got the skill, drive and consistency to break out this year, as both a player and DT selection. Whether it is enough to challenge the other DT premiums is another matter. there seems to be a bit of quality lacking around his price range. most coaches will have him i think.